Crest ProHealth is the best choice for an everyday toothpaste. Crest 3D White Luxe Glamorous White offers extra whitening power, and Sensodyne ProNamel is recommended for sensitive teeth. For those who want to avoid fluoride, Tom's of Maine Antiplaque and Whitening Fluoride-Free Toothpaste is a go-to natural option. If you're looking for an all-around, general-use toothpaste that offers cavity protection, fights plaque, and prevents gingivitis, look no further than Crest ProHealth. Experts and users alike say this toothpaste is an ideal choice for anyone aiming for overall dental health. Plus, instead of the usual sodium fluoride found in most toothpaste, it contains stannous fluoride, which doubles as an antibacterial agent for added plaque prevention and breath-freshening effects. If you want whiter teeth, Crest 3D White Luxe Glamorous White claims to remove up to 95 percent of surface stains within three days with twice-daily brushing. 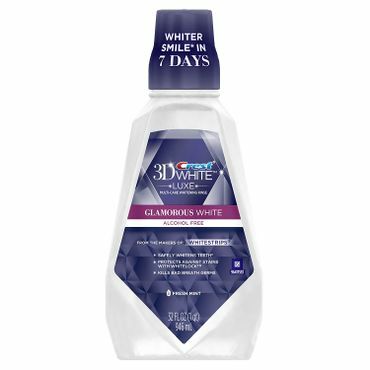 Part of the Crest 3D White whitening lineup, users say it works especially well for maintaining teeth that have been professionally whitened -- particularly when used in conjunction with other Crest 3D White products. It also contains fluoride for daily cavity protection. If you're looking for an added whitening boost, users say Crest 3D White Multi-Care whitening mouthwash works great when combined with Crest 3D White toothpaste or other whitening products. In addition to removing surface stains, Crest 3D White Multi-Care Whitening Mouthwash protects teeth against the formation of future stains. Reviewers say it has a pleasant, not-overpowering minty taste and, with continued use, does help to maintain whiter teeth. 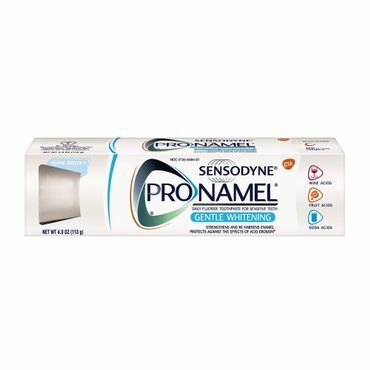 Sensodyne is the leading toothpaste brand for people with sensitive gums and teeth, and the ProNamel Gentle Whitening Toothpaste is the obvious favorite among users. The vast majority of owner reviewers say it doesn't cause irritation, and it is specially formulated to combat acid erosion by re-hardening acid-softened enamel. It also gradually -- and gently! -- whitens teeth, and users say it has a pleasant minty flavor. 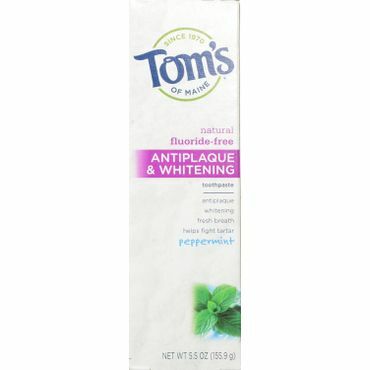 Instead of fluoride, Tom's of Maine Antiplaque and Whitening Fluoride-Free Toothpaste uses zinc citrate sourced from zinc, a naturally occurring mineral, and xylitol, which is derived from birch trees or corn. Experts say the ingredients raise a low level of health concern; it contains no artificial dyes, sweeteners or flavors, and it's even gluten-free. Most users love the mild, pleasant taste and say the product is effective in battling plaque. According to dentists, the best toothpaste protects teeth from cavities, softened enamel and plaque, which hardens into tartar if not removed at least every 24 hours. Tartar -- also known as calculus -- builds up and makes teeth and gums susceptible to decay. This leads to gingivitis, which can develop into serious periodontal disease. Users have slightly different priorities, generally looking for toothpaste with a palatable flavor, good consistency (neither too runny nor too hard) and a pleasant texture. People also seek a clean, fresh feeling -- and appearance -- after brushing. This type of toothpaste aims to brighten teeth, but the majority simply remove surface stains rather than changing the underlying color. Still, these products are good for people with coffee-, wine- or tobacco-stained teeth -- or for those who want to maintain the whiteness of their teeth after using teeth whitening products, like whitening strips, or receiving professional treatment. These toothpastes are usually "all-in-one" and are designed to fight plaque while whitening. Most major toothpaste makers also produce a separate whitening mouthwash to use in conjunction with your toothpaste. This type of toothpaste is designed to alleviate tooth and gum sensitivity by building up the user's resistance using a chemical anti-sensitivity agent like potassium nitrate or strontium chloride. Some users only need to use a sensitive toothpaste for a few months -- such as after using a whitening product like strips -- while others need to use it long-term to keep ongoing sensitivity at bay. However, sensitive toothpaste has a cumulative effect, so they are most effective when used consistently for twice-daily brushing. These are preferred by some people who are sensitive to fluoride or simply prefer to avoid fluoride-containing products. Although there are a number of fluoride-free options that fight plaque and freshen breath, no fluoride-free toothpastes are approved by the American Dental Association (ADA), as fluoride is considered the gold standard among experts for cavity prevention. Fluoride-free toothpastes often contain xylitol, an ingredient derived from birch trees or corn, zinc, and natural extracts from roots, leaves or fruit. There is no agency that regulates toothpaste, but some toothpastes earn the ADA (American Dental Association) Seal of Acceptance. This means that the product inside has been scientifically evaluated to be safe and effective. The ADA does not give its seal to fluoride-free products, but just because a product does not have the ADA seal, that does not mean it's not a safe, effective toothpaste. To help you find the best products for all your dental health needs, we also cover teeth whitening products and electric toothbrushes in separate reports. We found expert reviews recommending the best toothpaste for different purposes – such as whitening toothpaste and toothpaste for sensitivity -- at Reviews.com, David Evans, DDS, Real Simple and Men's Health. Refinery29 and Business Insider also recommend the best toothpaste for different needs, such as whitening and tooth sensitivity, based on input from dental professionals. For natural toothpaste, GoodGuide provides impartial ratings for ingredients, health and environmental risks, and other considerations important to users who prefer a natural alternative to traditional toothpaste. However, because the factors that make one toothpaste better than another are largely subjective, we relied heavily on user opinions from sites like Amazon, Walmart, Walgreens and TotalBeauty, where we found thousands of user reviews offering feedback on the taste and performance of different toothpastes. We combine expert and user feedback to come up with our recommendations for the best toothpaste overall, as well as the best whitening toothpaste, sensitive toothpaste and fluoride-free toothpaste. 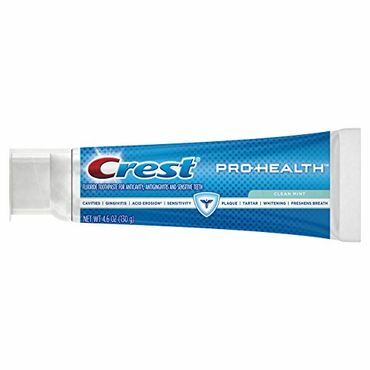 For those looking for an effective, all-around general-purpose toothpaste, Crest ProHealth (Est. $6) earns accolades from experts and users alike. Editors at Reviews.com name Crest Pro-Health the best all-around toothpaste, calling it "a multi-purpose toothpaste good for those with no specific dental issues." It's the only toothpaste line they found that contains stannous fluoride (rather than the more commonly used sodium fluoride), which "doubles as an antibacterial agent, allowing Crest Pro-Health to target plaque, gingivitis, and bad breath on top of tooth decay." And according to editors at Men's Health, it's the only toothpaste recommended by the American Dental Association in seven categories. Crest ProHealth comes in several formulations, including Advanced Deep Clean Mint, Advanced Gum Protection, Advanced Active Strengthening, Smooth Peppermint, Sensitive & Enamel Shield, Whitening Power and Advanced Whitening Power, Clean Mint and several options for children. The Sensitive Shield formulation earns a nod from Real Simple's Sarah Smith, who says it "forms an imperceptible barrier around teeth to calm delicate nerves that are agitated by pain triggers, like hot and cold drinks." Among hundreds of users posting feedback to sites like Amazon, Walmart and Walgreens, most say Crest ProHealth tastes great and leaves their mouths feeling fresh and clean, producing just the right amount of foaminess to last through a full brushing. Many users say that Crest ProHealth doesn't make their teeth sensitive like other toothpaste. However, there is an exception: Some users find the Advanced Deep Clean Mint formulation too strong, and a few say it actually makes their teeth more sensitive to hot and cold. We also read some complaints from users who say that toothpaste tends to build up around the top, making the flip-top lid difficult to close and the toothpaste messy to use as a result. Overall, though, most users are pleased with the performance of the various Crest ProHealth formulations. For a dependable toothpaste that provides lasting fresh breath protection, take a look at Colgate Total (Est. $4). It comes in several different formulations: Daily Repair, Advanced Whitening, Advanced Deep Clean, Advanced Clean In-Between, Advanced Fresh + Whitening, Clean Mint, Fresh Mint Stripe Gel and Whitening. Colgate Total is accepted by the American Dental Association (ADA) and contains both fluoride and triclosan -- a broad-spectrum antibiotic -- to kill bacteria that cause cavities and gum disease. A copolymer allows the triclosan to remain active between brushings, even after you eat or drink. While user reviews are actually more positive for Colgate Total compared to Crest ProHealth, concerns about triclosan may be problematic for some -- and that ingredient is why we dropped it from our top spot this year. There's been controversy surrounding triclosan for several years now -- some scientific findings claim it can act as an endocrine disruptor in animals, and possibly in fetuses. In December 2017, the FDA banned the sale of soaps and body washes that contain triclosan or 23 other active ingredients (without a premarket review), according to Consumer Reports, "because manufacturers haven't proved that they're safe for long-term daily use and more effective than regular soap and water for controlling certain infections." However, toothpaste is not included in the ban, nor are other products such as cosmetics, cleaning products and even athletic clothing. Both Colgate and the FDA maintain that the antibacterial agent is a beneficial ingredient in toothpaste and extremely effective in reducing plaque and preventing gingivitis. Colgate Total is not recommended for kids under 6, as its antibacterial properties have not been tested for young children. It's moderately abrasive and contains sodium lauryl sulfate, which can sometimes irritate sensitive mouths. Real Simple names Colgate Total its Best Overall Toothpaste in a roundup of several oral care products, citing its germ-fighting capabilities. Specifically, the review mentions Colgate Total Enamel Strength, which is now called Colgate Total Daily Repair. This formulation aims to strengthen teeth by re-mineralizing weakened enamel. Colgate Total Daily Repair is also named the best toothpaste for mouth health by editors at Men's Health, who base their recommendations on feedback from a panel of dentists, and Dr. David Evans, DDS calls it "a great all-around toothpaste for most patients." Hundreds of user reviewers are very enthusiastic about Colgate Total's pleasant taste and good cleaning power. Some say the Whitening formula doesn't do all that much in terms of whitening teeth, but generally, the majority of Colgate Total users seem to love it as their go-to daily toothpaste. Another toothpaste that gets rave reviews from hundreds of users is Crest Cavity Protection (Est. $4), which reviewers say is what they consider "classic Crest" -- a basic, all-around toothpaste that fights plaque and prevents cavities without the frills like mouthwash and fancy flavors. It's a paste, not a gel formulation, and while it does have a traditional mint flavor, users say it's just right -- not too overpowering. Reviewers say Crest Cavity Protection is gentle and won't aggravate tooth sensitivity, yet it still provides long-lasting fresh breath. Crest Cavity Protection earns the ADA Seal of Acceptance, and it can also be used by children under the age of 6 (with supervision and in pea-sized amounts to minimize swallowing). Users also appreciate the standard screw-on cap, which is less messy than flip-top lids. 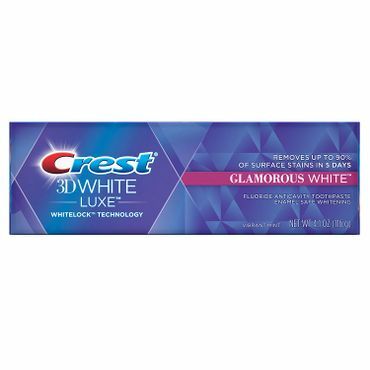 If your smile could use a little brightening, Crest 3D White Luxe Glamorous White (Est. $4) is a popular choice. It claims to remove 95 percent of surface stains in just three days when used as directed. Crest 3D White doesn't actually whiten teeth -- instead, it removes stains with a polishing silica ingredient. Like all the other products we've discussed, Crest 3D White contains fluoride, so regardless of its whitening abilities, it'll give you an anti-cavity benefit with daily use. It also earns a nod from Refinery29, where Victoria Veytsman, DDS, a New York-based dentist, says it's her go-to toothpaste and says she has noticeably brighter teeth after using Crest 3D White. Crest 3D White has earned hundreds of customer reviews across Amazon, Walmart and Walgreens, the vast majority of which are positive. Users say the product is an especially good choice for maintaining teeth that have already been professionally whitened. The minty taste is also a big hit, and users say it offers long-lasting fresh breath. A few people report some sensitivity after continued use of this toothpaste -- a common effect of whitening products -- especially when used in conjunction with other Crest 3D White products such as the whitening strips. Colgate Total Whitening (Est. $4), part of the Colgate Total line discussed above, is also a user favorite among whitening toothpastes. Like other toothpaste in the Colgate Total lineup, it does contain triclosan, which some consumers may opt to avoid. For those who don't mind the triclosan, which we discuss above, Colgate Total Whitening fights germs for up to 12 hours after brushing and helps to prevent cavities, plaque, tartar buildup and gingivitis. Reviewers on sites like Amazon, Walgreens and Walmart say that it's effective at removing and preventing surface stains from coffee, tea and tobacco and has a pleasant minty taste that's not too strong. Some users say that beyond removing stains, they don't notice a true whitening effect after using this toothpaste. Others, however, point out that a whitening toothpaste alone shouldn't be expected to actually lighten teeth by several shades, and say it does what you'd expect from a whitening toothpaste while also freshening breath and leaving their teeth feeling squeaky clean. Both Refinery29 and Business Insider recommend Arm & Hammer Advance White Extreme Whitening Baking Soda & Peroxide Toothpaste (Est. $3) after consulting with cosmetic dentists and other dental professionals. It contains baking soda to gently remove plaque and surface stains, peroxide to combat deeper, set-in stains, and Arm & Hammer's Stain Defense technology to help prevent new stains from forming. Arm & Hammer Advance White Extreme Whitening doesn't have the ADA Seal of Acceptance, but it does earn rave reviews from hundreds of users who say it leaves their teeth feeling cleaner compared to other toothpaste. Most say it has a pleasant minty flavor, although some reviewers say that the baking soda creates an unusual, slightly salty taste and less-than-smooth texture that takes a little getting used to. That said, the majority of users say it leaves their teeth looking polished, shiny and noticeably whiter. If you want whiter teeth and fresh breath that lasts all day, Crest Complete Multi Benefit Scope Outlast Fresh Breath Whitening Toothpaste (Est. $6) tackles both concerns. It claims to visibly whiten teeth after a single tube, while also protecting against cavities, preventing tartar buildup and removing surface stains -- and it promises to keep breath feeling fresh up to five times longer compared to other toothpaste. Among thousands of reviews across Amazon, Walmart and Walgreens, some say that Crest Complete Multi Benefit Scope Outlast can feel overpowering at first, especially after switching from a milder toothpaste, but most users get used to the intensity after a week or so. Because it contains Scope, reviewers say they don't feel like they skipped a step in their morning routine if they don't have time to use a separate mouthwash. As with most whitening toothpaste, opinions are mixed on how well Crest Complete Multi Benefit Scope Outlast whitens teeth. Some users say they notice whiter teeth within the first week, while others have noticed little whitening effects. Most who haven't noticed dramatic whitening effects still say this toothpaste leaves their teeth feeling incredibly clean and their breath fresh all day. Many reviewers mention this toothpaste's Sugar Shield technology, which protects teeth from the effects of sugar found in many foods. It's worth noting, however, that many reviewers note that they received a tube of this toothpaste free in exchange for a review. If whitening toothpaste alone doesn't cut it, consider adding a whitening mouthwash to your daily regimen, such as Crest 3D White (Est. $6), which is part of the Crest 3D White lineup of teeth whitening products. It can be used in conjunction with whitening toothpaste or ordinary toothpaste, although most users pair it with the Crest 3D White line of toothpaste. Crest 3D White mouthwash comes in five formulations including Luxe Diamond Strong, Luxe Glamorous White Multi-Care, Luxe Arctic Fresh Multi-Care, Vivid White and White Brilliance. All five formulations promise to whiten teeth. The Luxe Diamond Strong formulation also promises to strengthen weakened tooth enamel, and both Multi-Care formulations and the Vivid White formulation not only remove surface stains but also protect against the formation of future stains. White Brilliance is an alcohol- and peroxide-free formula that promises a whiter smile in seven days when used as directed along with brushing to remove surface stains. We read hundreds of user reviews for Crest 3D White's whitening mouthwash, most of which are positive. Some say the flavor is too sweet, while others appreciate that it doesn't have an overpowering minty or medicinal taste. Opinions are mixed on the whitening effect; while some say they do notice a difference after several weeks of use, a few users point out that their teeth returned to their prior shade after they stopped using this mouthwash. Most reviewers who report noticeably whiter teeth say they use Crest 3D White mouthwash along with other products from the Crest 3D White lineup.